In partnership with the Tanzania Financial Intelligence Unit, the Global Center hosted a two-day training course on money laundering and terrorist financing risks associated with new financial technologies in Tanzania, supported by the government of the Netherlands. The training focused on understanding the technology and risks surrounding pre-paid cards, bitcoin and blockchain services, and the mobile money sector. 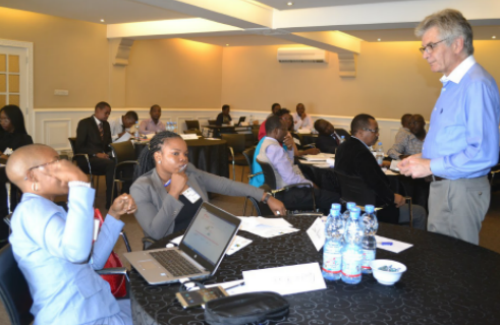 The anti-money laundering and countering the financing of terrorism (AML/CFT) training seminar brought together 22 participants from the FIU, the Bank of Tanzania, Tanzania Communications Regulatory Authority, and a number of Tanzanian mobile money service providers, including Vodacom, Airtel, Tigo, Halotel, Zantel, SMART, and BitPesa. The meeting was co-facilitated by Mr. Peter Warrack, Director of AML Risk-Intelligence Unit for the Bank of Montreal Financial Group, and Ms. Mercy Buku, an international AML/CFT specialist on mobile payment systems, formerly Senior Manager of the Money Laundering Reporting Office for Safaricom Limited.